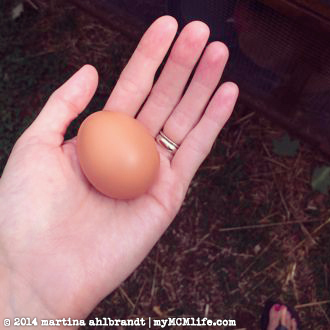 At 5 months old, our first hen started to lay eggs! Meringue the Rhode Island Red (dark brown one pictured below) is our first layer. She started on 7/7/14 while we were on vacation. We missed the thrill of finding the first one in the nest box but my mom collected them each day and saved them for us. They’re a bit small to start out so we waited until the 9th day when we had 8 eggs (before she laid the 9th) and we all enjoyed a wonderful fried egg breakfast. 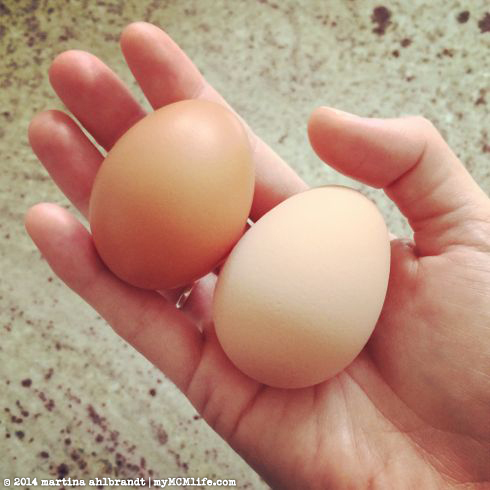 Meringue has laid a perfect, beautiful, small brown egg every day without fail for the past 17 days. 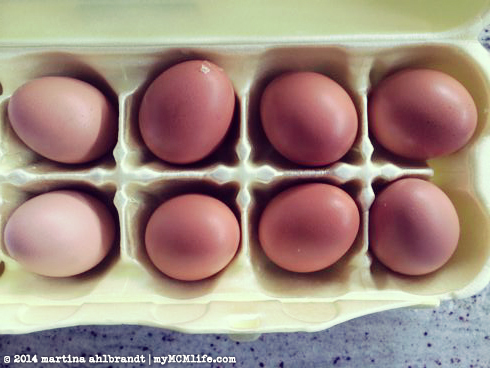 It’s bizarre and wonderful to eat eggs that were collected from our own backyard. 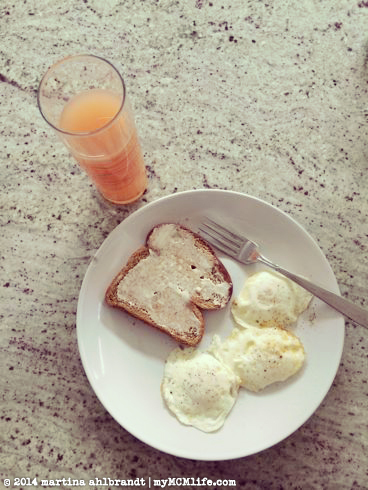 I joyfully discovered our first two-egg day, which was almost as exciting as the first egg. Sunny S.U. 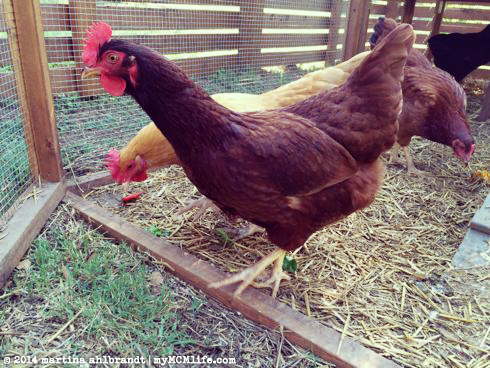 the Buff Orpington (gold one pictured below), my favorite hen, was our second layer starting on 7/19/14. 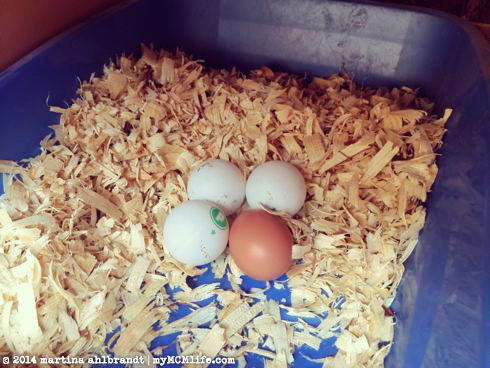 I’m really proud of my chickens and I’m excited for the others to start laying, too. Within a month Poach and Custard (black and orange ones below), the Black Star and Production Red, should start laying. By the end of October we might be getting half a dozen eggs per day, which is good because our family can easily eat half a dozen eggs in one breakfast. The plan is to have plenty to share with friends and neighbors though. 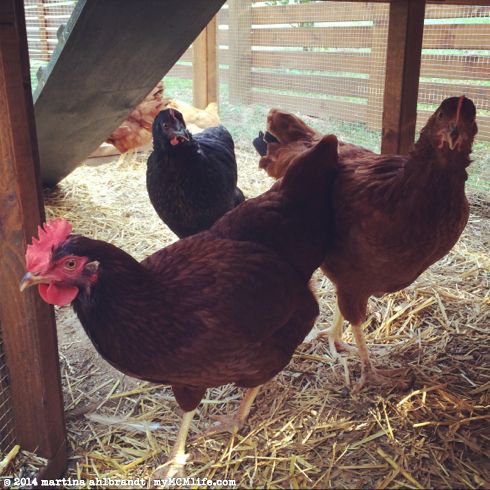 This entry was posted on Thursday, July 24th, 2014 at 6:00 am and is filed under Art, Art: Cooking, Art: God's creation, Family, Family: Chickens. You can follow any responses to this entry through the RSS 2.0 feed. You can skip to the end and leave a response. Pinging is currently not allowed.